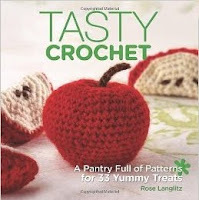 Doesn't this book look so yummy - just look at that juicy apple and those adorable apple slices, even though I don't particularly like apples myself I'm still itching to get the crochet supplies out and have a go at making some myself. The patterns inside are all just as yummy as promised on the cover each beautifully photographed and with some you have to look twice to work out what is crochet and what is proper food. I also love the layout of this book. 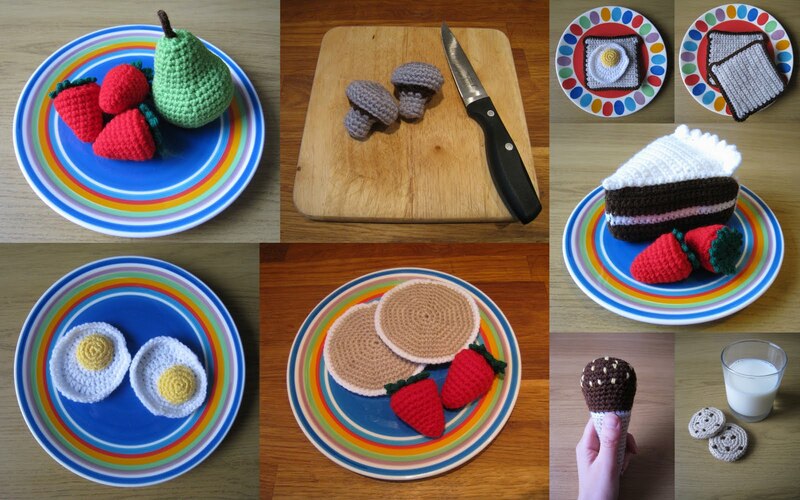 The patterns are divided into four sections, Breakfast, Lunch and Dinner with each pattern including a 'ingredients' sidebar listing everything you'll need to make the item. The patterns are all well written with clear instructions and minimal abbreviations making them very easy to read and follow. In fact these patterns are so easy to follow that during the last two weeks of crocheting I've managed to make 9 of the projects and all of them I'm pleased as punch with! This is certainly a book that I would highly recommend and perfect for making a really good range of play food for little ones or perhaps even yourself... I'm now off to try and make those cute little slices of apple, perhaps have a go at making a slice of pizza and if there is time then maybe I'll give the pattern for the pita pocket with falafel a go too! You have sold me - I need to get this book. Too old for dressing up?